(CNN) -- Tracy Dupire of Worthington, Indiana, loves to drive her 2002 Ford Mustang convertible with the top down when the weather is nice. She's always had an American car and hopes she always will. 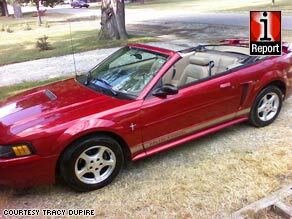 Tracy Dupire of Worthington, Indiana, loves her 2002 Ford Mustang and always buys American cars. "It's hard to rationalize sending all of our money overseas. You have to buy American products and back American workers," says Dupire. The question of value in American-based auto-manufacturers is coming to a head as President Obama advocates for a bailout of two of the Big Three auto manufacturers and asks the companies to present a plan for progress. General Motors and Chrysler requested a combined $21.6 billion Tuesday on top of existing federal loans due to worsening demand for cars and trucks. Ford said it has enough money for the time being to make due without the bailout. Dupire wants to see the American-based auto manufacturers supported with conditions and close supervision. Auto manufacturers waited too long to make changes and are paying the price for imprudent extravagance, Dupire says. "It's just a slap in the face to America. I have to get by on a budget, why shouldn't they have to?" What makes an American car American? iReport.com: How do you define an American car? Kelly R. Verhelst of Oostburg, Wisconsin, says her family always buys American cars and she feels doing so helps her country. "I don't always agree with the big labor unions and management styles but there is just something about American pride. Our country has been bombarded with foreign-made products from clothing to electronics." Daniel Luke Diaz of Diamond Bar, California, has only bought American cars his entire life -- he even drove a Hummer during his time in the military. He says, for the most part, American cars provide good value. He also says he feels a responsibility to buy American. By buying foreign cars, "You might as well be laying off the American autoworkers yourself and handing their paychecks to those foreign automakers personally," says Diaz. The American auto industry can be turned around if top executives renew their focus on quality construction and better materials, says Diaz. "I believe Americans want cars to be as durable as they were 20 years ago. No cutting corners." He says foreign automakers have used a "quantity-over-quality strategy" that flooded markets and made the cars seem more reliable. Marketing is a huge part of the solution for turning around the auto companies, he says. "American consumers simply want to know the American cars on the road will last, will have a long-term warranty, and that parts will be readily available and labeled 'Made in the USA.' "
"We need to keep our factories going and our people employed. Give the American car companies a shot." But Nicholas Coday of Eugene, Oregon, says he finds cars from the so-called Big Three to be inferior to imports. He views the bailout plans as a "necessary evil" since the auto industry is so large and employs so many people. "I think the autoworkers are being hurt in the end as they are given a false sense of security by the bailout and the [auto workers] union. It does not matter how much money we pump into the company if consumers cannot afford their vehicles or would rather buy vehicles from their competitors." He singled out Ford as the only company of the Big Three he feels "has a clue" and coincidentally isn't asking for the bailout money. "They have realized that not everyone wants an SUV or a truck and they cannot afford the cost of a Mustang, so they have rolled out affordable models such as the Focus and Fusion, which I have seen good reviews on." Another "unsatisfied" American car owner is Concordia University student Suraj Suba of Montreal, Quebec. He likes his Chrysler Intrepid but says styling and fuel efficiency could be better. "The way I see it, they [should] have a lot of power. You [should] feel like you're driving a manly car when you're driving an American car. It doesn't feel flimsy, and it doesn't feel like it's going to break." He views Ford's own strides in these areas as reasons why the company hasn't yet asked for federal money. "The whole American-made, Ford-tough. ... That's what's lacking at GM and Chrysler. It doesn't have that pride."